The “Gio Express” made another stop, Saturday night, at the Emerald Queen Casino in Tacoma, Washington, in a 10 round main event presented by Brian Halquist Productions. This was Halquist’s “Battle At The Boat 120” and the feature bout pitted Super Featherweights Giovanni “Gio” Cabrera Mioletti (16-0-0 w/7 KOs) Chicago, Illinois taking on Recky Dulay (11-5-0 w/8 KOs) Philippines. Although scheduled for 10 rounds “Gio” made it an early night, first picking apart Dulay with crisp jabs and counter punching, as Dulay tried to close the distance and landed some shots of his own. In the third round Gio began battering him with power shots, which resulted in Dulay remaining on the stool and not coming out for the fourth round. He had enough of the “Gio Express”. In another dominant performance by “Gio” this one goes down in the record books as his 16th win, via a TKO in the 3rd round. 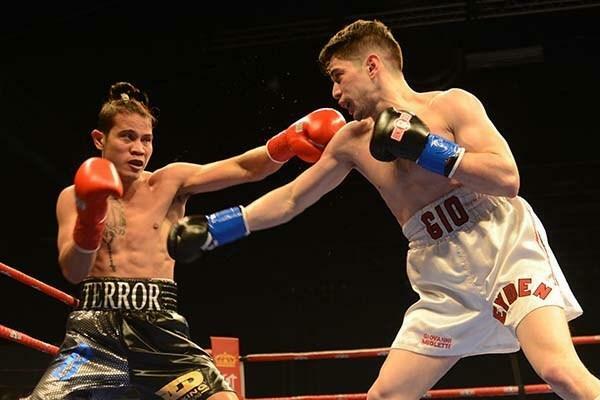 I first wrote an article on Gio which was published on this website (dmboxing.com) in June of 2018 and told readers “Keep an eye on this kid…” Since that article he has gone 4 – 0 with all four wins by knockout. But what is especially promising about “Gio” is in his first seven (7) pro fights he went 7-0 with only one (1) win coming by KO. However, in his last seven (7) pro fights, as he has moved up to 10 rounders, where the competition has become tougher and where the opponents are more experienced, “Gio” has gone 7-0 with five (5) wins by KO. These have included knockout wins over Headley Scott (11-0-0), Elijah Pierce (8-0-0), and Ray Lampkin, Jr. (11-0-0). So keep an eye on this fast moving young star, whom dmboxing picked as one of 2018’s top prospects. He’s 24 years old and about to break out onto the world stage. The next stop for the “Gio Express” will be in June, possibly for a regional or continental title and another step closer to a world championship. Stay tuned, we’ll keep you posted! Mioletti sounds like a JLW 2 keep eyes on. Interesting note that he beat unbeaten Ray Lampkin Jr.